An Emergency Transmog For A Stubborn Paladin | Neri Approves! The other day while I was catching up with my blog roll, I noticed something truly horrific. My husband, Disconcur, has been immortalised in comic form! Well, that wasn’t the horrific thing, yay for Disco! The horrific thing was his outfit: compared to the class and elegance of bloggers such as Navimie, Luxypie, as well his fellow raiders, my husband’s Paladin looked like it had been raiding the Good Sammy’s donation bin while the others had been shopping at exclusive, high fashion boutiques. No, no, no, this will not do at all! 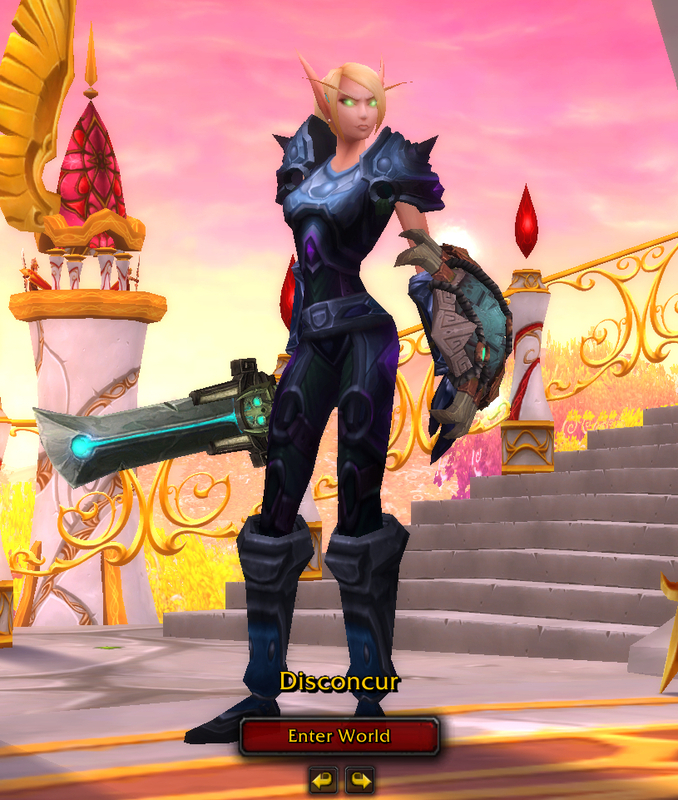 After some debate, “I don’t like transmog. Okay, I don’t like slutty transmog, it looks silly” I managed to get him kitted out on a set that doesn’t look like complete garbage in the 15 minutes it took for him to put our son to bed before raid. Verdict: I was worried at first that the mix and match of two crafted PvP sets would make him look just as silly as before, but I was limited by what was on the auction house at the time. It seems to work, though, and he approves of the chunky boots and gloves. The colour scheme looks pretty good overall, and I was pleasantly surprised when his weapon and shield didn’t look completely out of place with this ensemble. In the end, I actually got a satisfactory seal of approval from Disco! He said it reminded him of the outfit a favourite anime character of his wears. What a fluke! 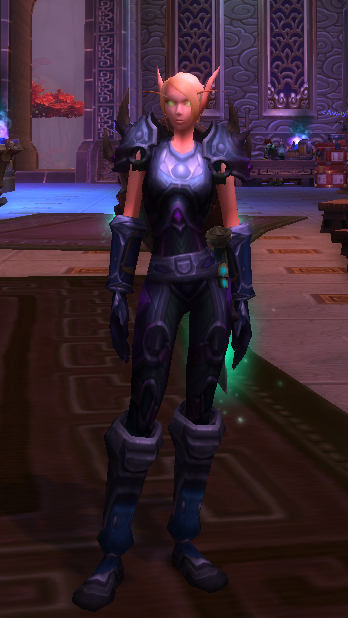 Tags: Holy Paladin, Plate, Transmog, Transmogrification. Bookmark the permalink. Haha! He looks so much better.